Indian Beauty Blog | Fashion | Lifestyle | Makeup | SparkleWithSurabhi : Make Your Own Prolong Wear Lipstick! You can apply a concealer or any neutral lipstick as a base first. Then apply the Inglot/ Or any lipstick. I used #69 from the Inglot freedom palette. Apply Pro long wear lipgloss on top in order to seal your lipstick. Do Not Drink or Eat for 15 Minutes. This will seal your lipstick for atleast 6 hours. 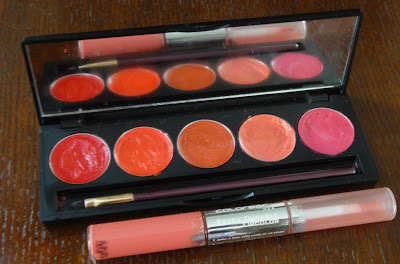 I used the colorbar extra durable lipcolour. Prolong wear lipgloss is available at MAC, Inglot and Colorbar. Availability: Any Mac, Inglot or Colorbar Store. Price: ranges from 300 INR -1200 INR.